The Indian state of Gujarat is of a similar size and population to Great Britain with a unique cultural heritage. The most famous Gujarati is undoubtedly Mahatama Gandhi but did you know Freddie Mercury’s family was Gujarati? Founded in 1987, Kingston upon Thames Gujarati School (KUTGS) is run by volunteers, with the support of The Royal Borough of Kingston upon Thames. The school welcomes children and adults from the whole community of all abilities, who would like to learn Gujarati language and gain a greater understanding of Gujarati culture. Students are also encouraged and supported to take an accredited GCSE in Gujarati. Special events are celebrated annually such as Diwali, Navratri, Holi and Christmas. Students participate in cultural songs, dance and drama at the school and with other community organisations. 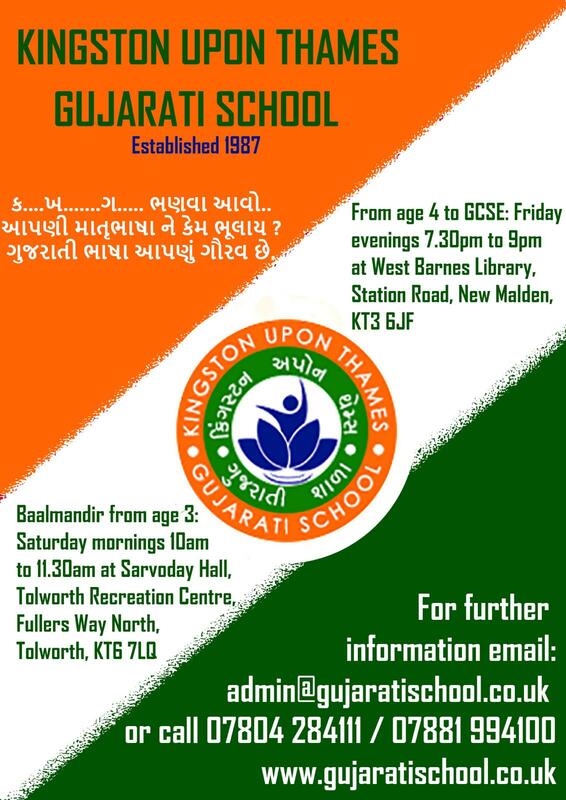 Friday evening Gujarati classes has a new home: West Barnes Library, Station Road, New Malden, KT3 6JF, and the Saturday morning Bal Mandir stays at Sarvoday Hall, Tolworth Recreation Centre. Please see the poster below.